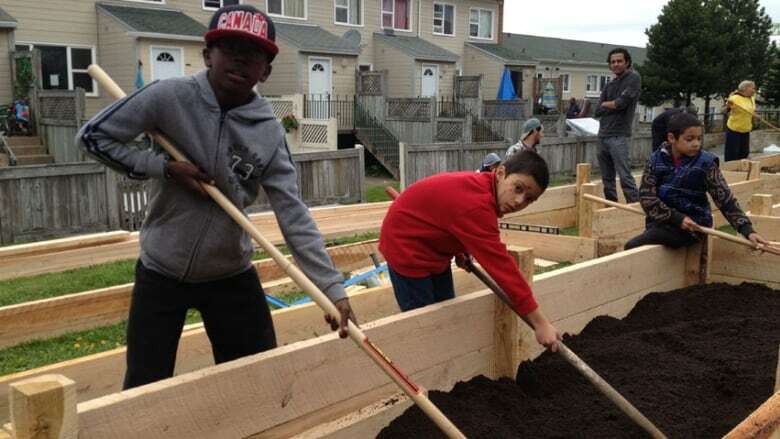 Two community gardens are offering Halifax residents the opportunity to produce their own local food. The north-end neighbourhood of Mulgrave Park is in the process of planting its first garden, which consists of 12 mixed-use plots. There are plans to plant herbs, tomatoes, carrots, lettuce, kale and pumpkins. Seeds will be planted next week. "We're encouraging people to come together in groups and as teams to work together and eventually share the harvest amongst themselves," said Paige Fara, who formed the group Progress in the Park in September to get the garden going. "And hopefully this will reduce the dependency on the food bank and introduce people to healthy, organic local food that they can grow right in their own community." Residents will also be able to participate in gardening workshops. Meanwhile, in the city's downtown, the Common Roots Urban Farm, now in its third season on the old Queen Elizabeth High School site, is expanding. 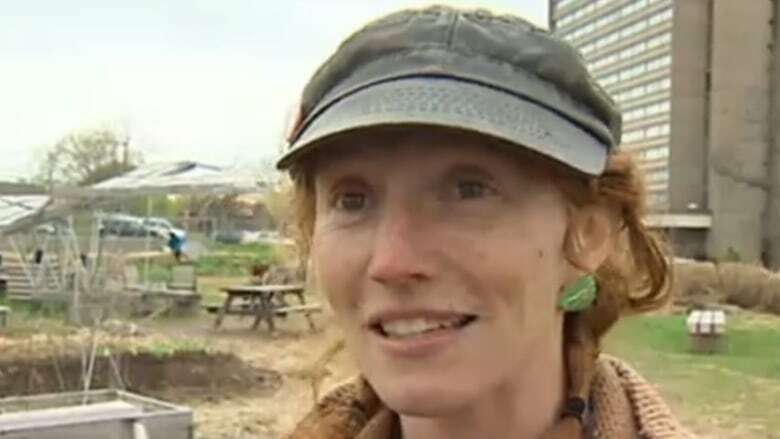 Jayme Melrose, project co-ordinator of the Common Roots Urban Farm, says the garden will offer a farmers' market stand on Fridays. (CBC)There are now 157 plots with a waiting list. "It's amazing and I'm totally blown away. There are so many people and the gardens are doing so well. There's interest and some of the funding is starting to come through," said Jayme Melrose, project co-ordinator. The farm was built to inspire a community vision of urban agriculture. Located next to the region's largest hospital and just a few blocks from the waterfront, the garden is a small slice of rural in a very urban environment. Every day you'll find at least 40 people working in the garden, working to rid the myth that food can't be grown in the city. "You don't need a lot of land to do it. These community plots are really tiny ... and people are growing a lot of food on it," said Leah Morris. The goal this season is to match the 1,600 pounds of vegetables grown last year for the Parker Street Food Bank. They also plan to grow some food for Capital Health Nova Scotia and other markets. "We've expanded the market garden a little bit and are going to do some wholesale and retail out of the market garden this year. So on Friday afternoons, we're going to have a little farmers' market stand," said Melrose. The farm is also in the middle of a Canada-wide online competition where they are currently ranked fourth. "If we can stay in fourth place until the end of the competition we'll be guaranteed $10,000. If we can push ahead to first place we'll be getting $20,000," said volunteer Carolyn van Gurp. The funds would be used to hire someone to co-ordinate a children's program and to buy tools and seeds. 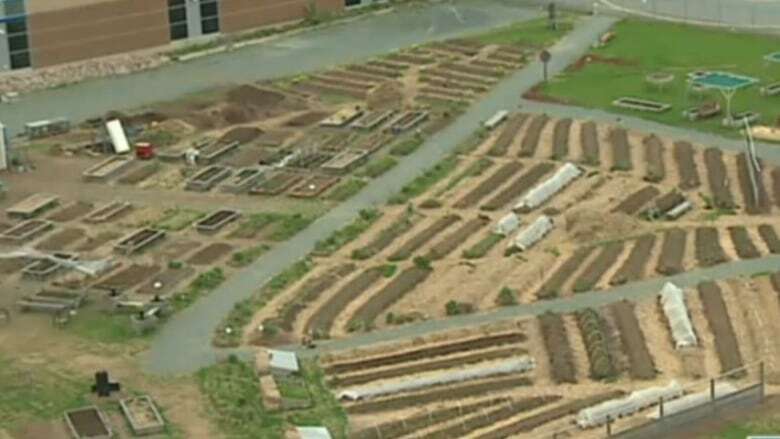 An aerial view of Common Roots Urban Farm in downtown Halifax, located on the site of the old Queen Elizabeth High School.